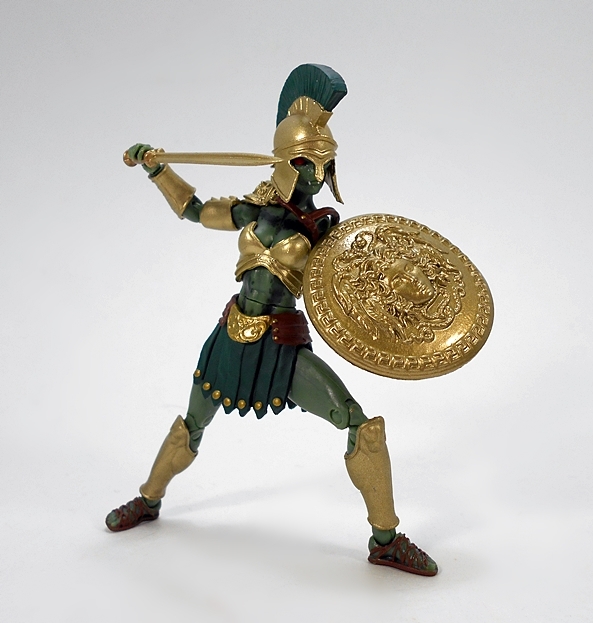 A couple of weeks back Indiana toy store, Kokomo Toys revealed their second Exclusive release from Boss Fight Studios’ Vitruvian HACKS series and I was quick to drop in a pre-order. It also reminded me how I’ve let this line has fall by the wayside when it comes to my reviews. I still have quite a few figures from Series 1, and I promise I’ll be getting back to looking at them regularly. But for now, I’m going to go ahead and push this figure to the head of the line, because I’m really excited to open her up and check her out. BFS have done a few exclusives in this line and they’ve all come in these simple, illustrated boxes. They’re certainly not as flashy as the full-color carded packaging used on the regular releases, but these are still collector friendly and the little boxes give you a place to keep all the extra bits. And there are a ton of extra bits! 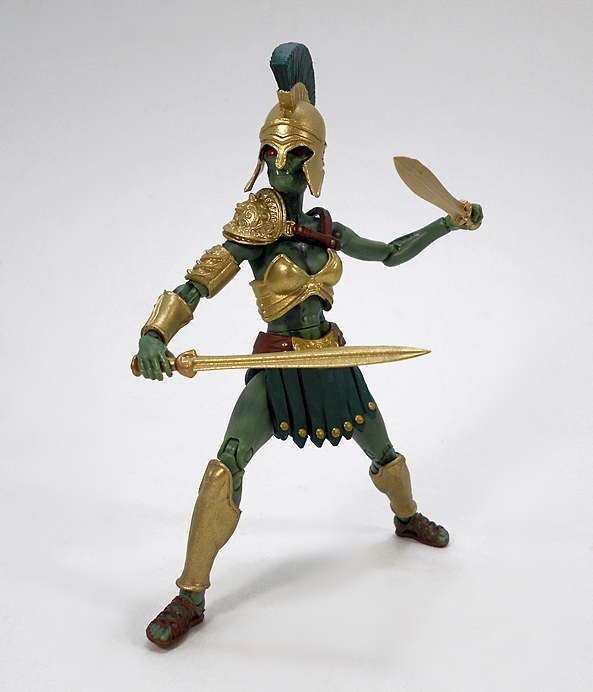 I probably could have bought three or four of these figures and kitted each one out to make them look unique. So, let’s start out with the basic figure and then check out all the extra goodies. 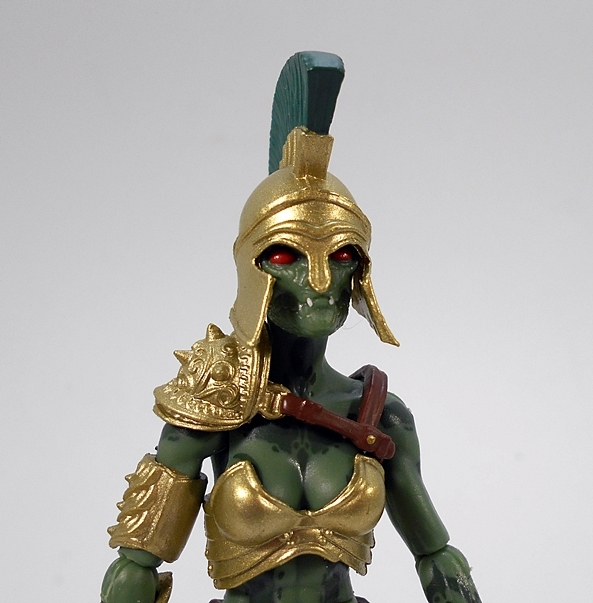 The Atelis Warrior (I’m just going to call her Atelis) is the result of a misguided attempt to turn human warriors back after they’ve been cursed as Gorgons. 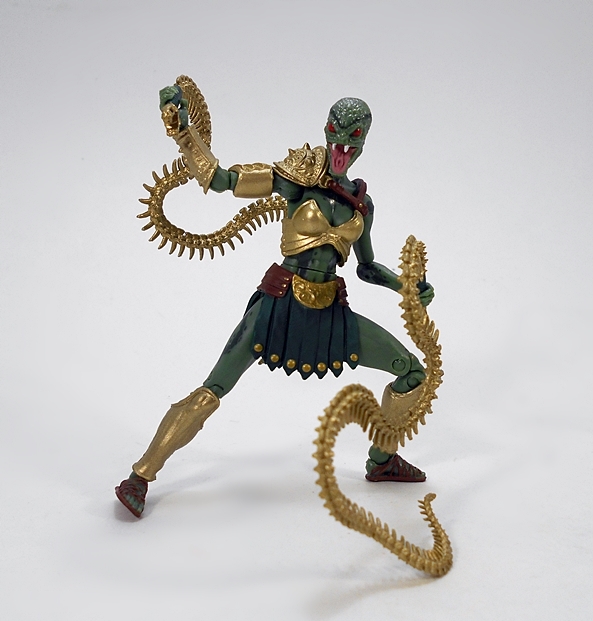 The result is this half-stage mutation warrior, who in the end still remained loyal to Medusa and the Gorgons. That’s a pretty rad backstory for what is a great looking figure. We’ve seen just about all of these parts before in previous HACKS figures that I reviewed here. You get the basic female buck, painted green. 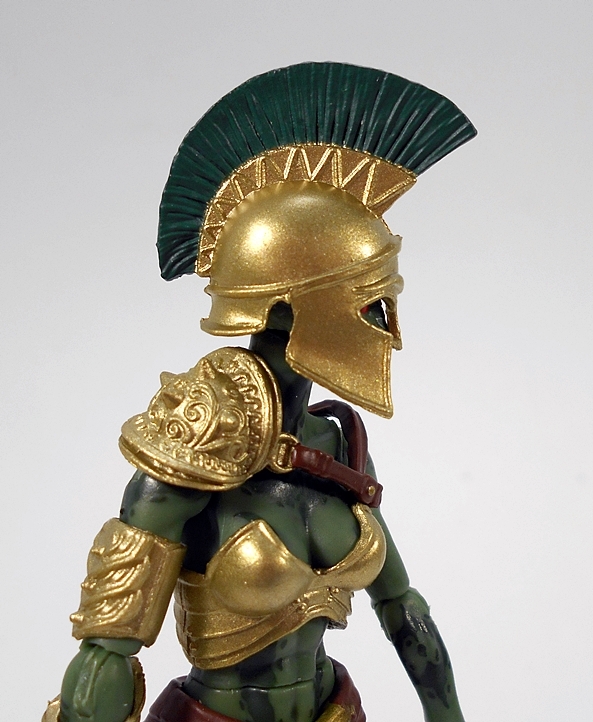 The chest armor, shoulder armor, and arm pieces all come from Medusa, while the greaves are from the Spartan Warrior. 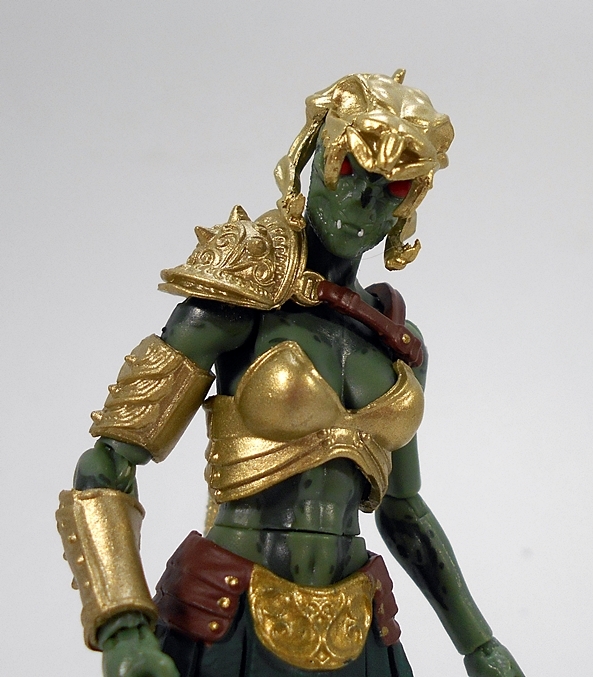 Pretty much all the armor and accessories here are repainted with a gorgeous gold and they all look fantastic. 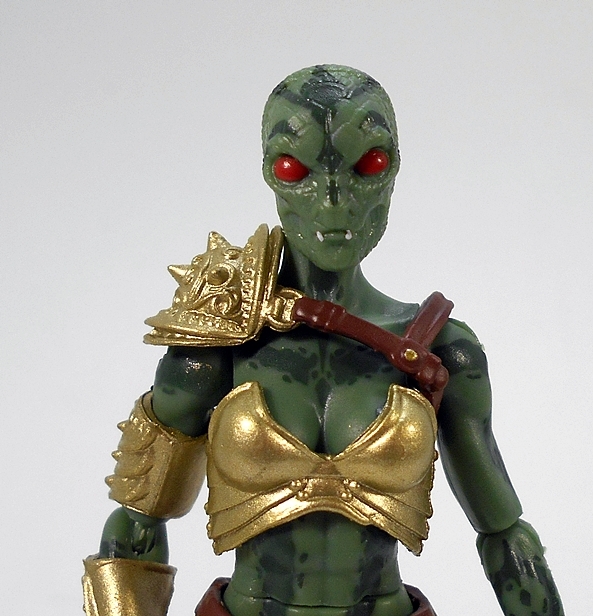 The sculpting on the shoulder piece is superbly done, especially for a 4-inch scale figure. I also really appreciate the individually painted rivets on the skirt and straps. 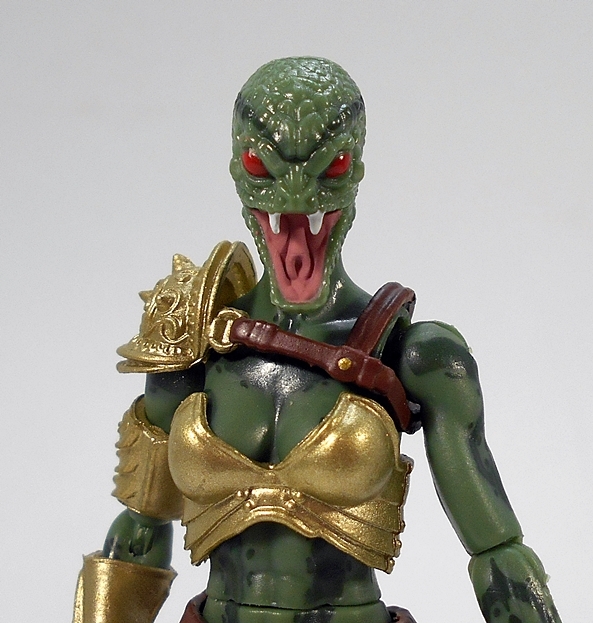 The sandal straps are individually painted, and even the body has some nice dark green markings to drive home the whole snake motif. 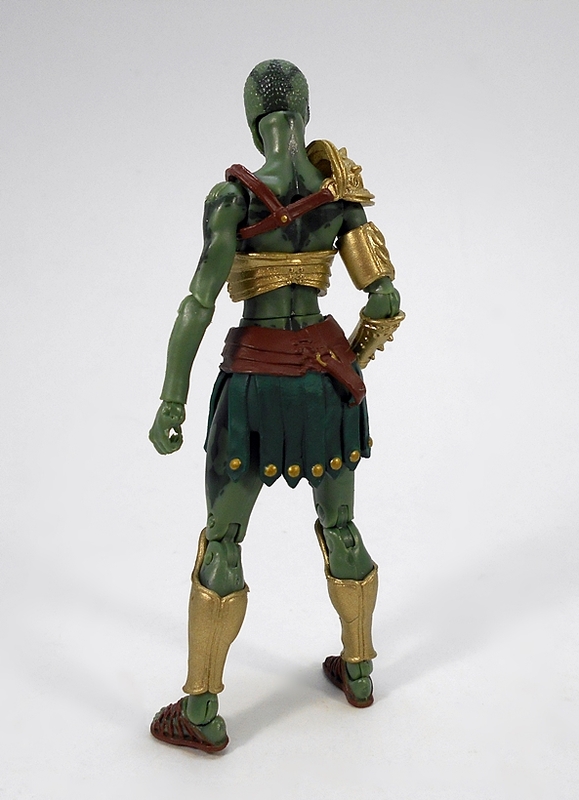 As always, all the armor pieces are removable and they are compatible with the other female HACKS figures. For that matter, even the figure itself can be disassembled and rebuilt fairly easily. Atelis comes with two head sculpts, which was an unexpected, but most welcome, surprise. 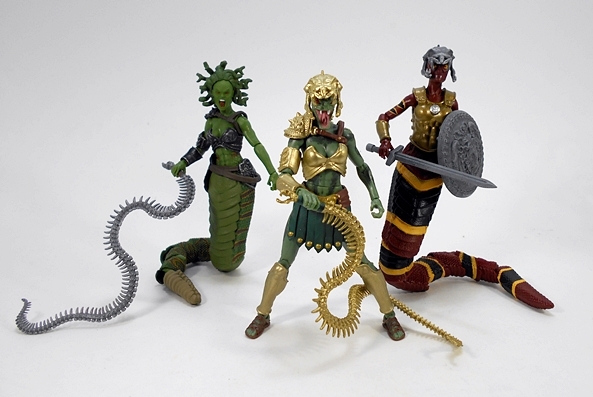 The standard head looks to be a repaint of the Coral Snake Gorgon head, which was part of the original wave of four figures. This portrait features some very nice sculpted scaling, and the eyes look incredible. The head attaches via a double ball-jointed post, which allows for easy swapping as well as a little extra movement in the neck. The second head is an even more incredible sculpt. You get the full open mouth with some beautiful work on the interior. I can practically see the venom glands in there ready to spew! This head has a little more of a sheen to it and both the sculpted scales and the painted markings are different for this head, so if you happen to be picking up a couple of these, you can diversify your display quite nicely. As long as we’re talking heads, let’s take a look at the head gear included with the figure. 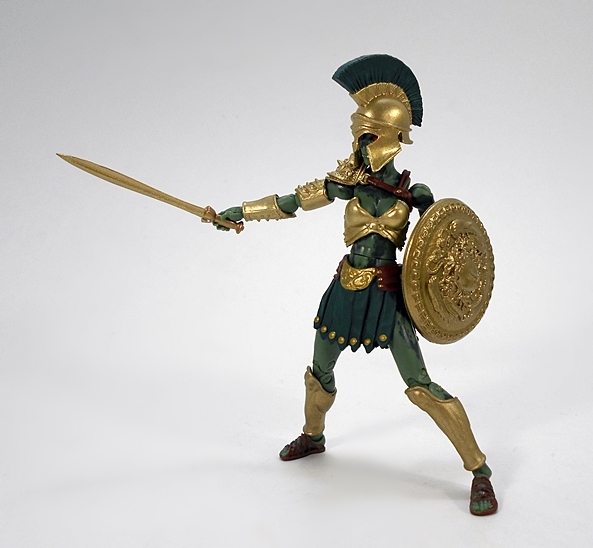 You get two types of head gear, the first being a standard Spartan-style helmet. We’ve certainly seen this before, and it looks great in the gold paint with a dark green comb on the top. 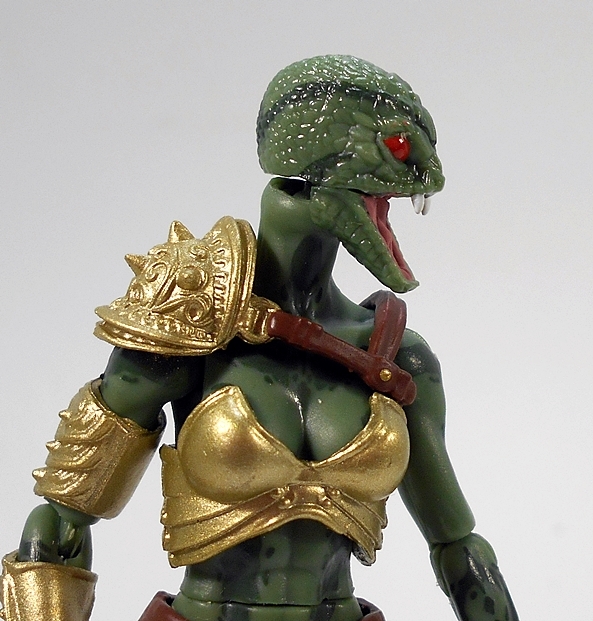 These helmets were obviously designed for the human heads, so the cheek guards splay out a bit on the snake heads, but I still think it looks fine. 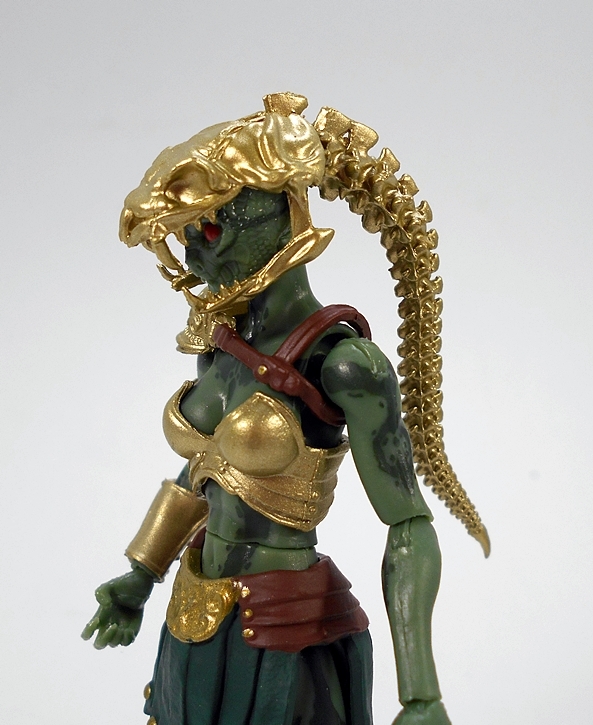 The other piece is a gold repaint of the snake skull headpiece we’ve seen with some of the Gorgons. 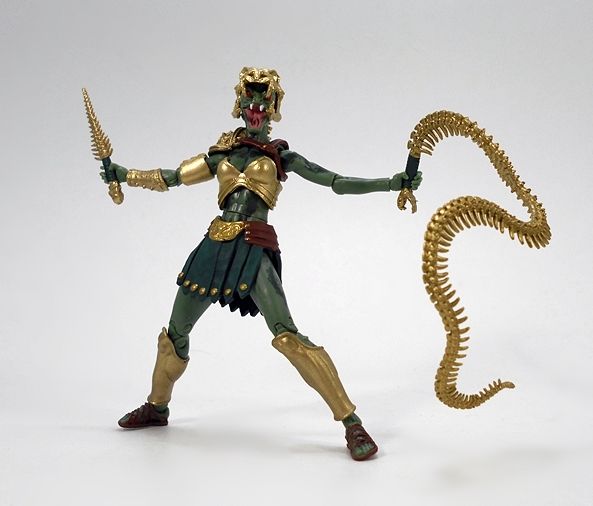 I loved the design of this thing when I first got it with the Coral Snake Gorgon, and I have to say it looks incredible in gold. BFS have really been packing these exclusive releases with a ton of weapons and Atelis here is no different. 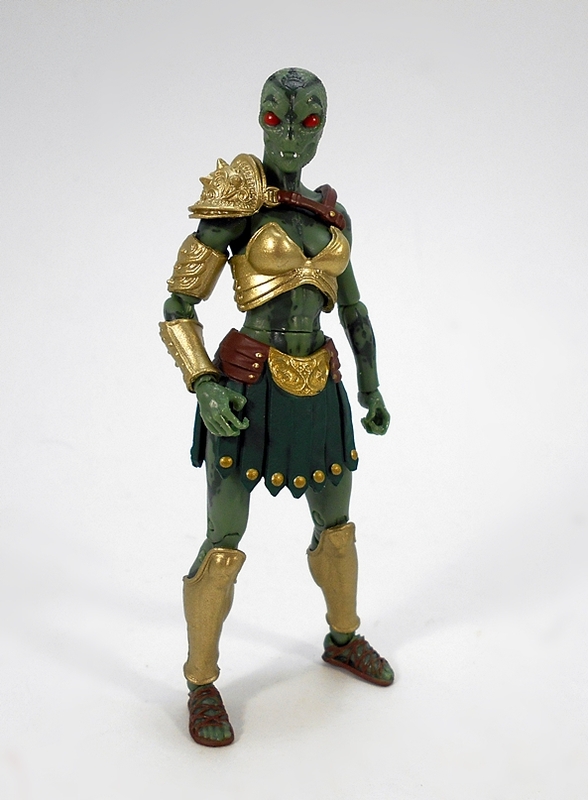 She comes with two sets of hands and each set has the hinges placed differently. As for the weapons, first off you get two of those skeletal whips that have been included with some of the Gorgons in the past. Next up, you get a pair of matched swords. These are the Etruscan style swords with leaf-shaped blades, all decked out in gold. You also get this sweet little skeletal dagger, which compliments the whips quite nicely. Get ’em caught in the whip and then make with the stabby-stabby! It’s a delightfully brutal combination. 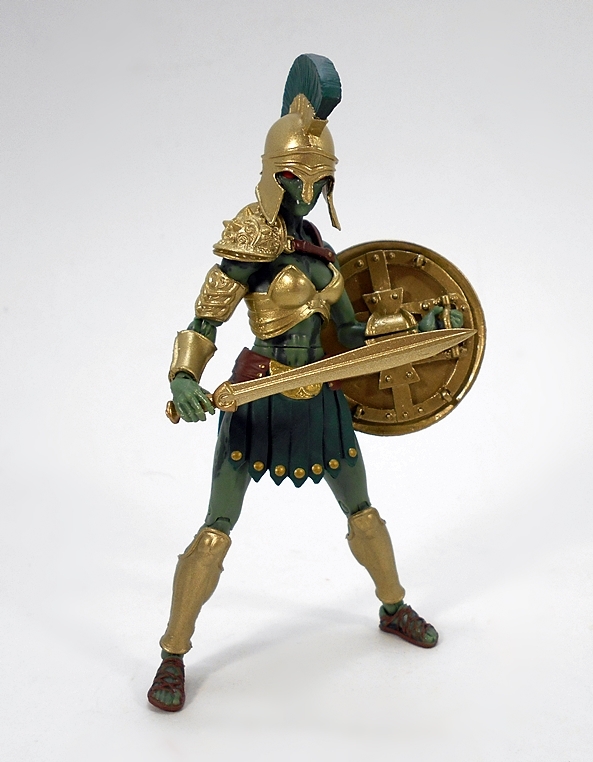 And finally, Aetlis comes with a gorgeous golden shield with Medusa’s face sculpted into it. This features the usual combination of sleeve and grab bar that allows the figure to hold it pretty securely. It can be a little bit of a chore to get her hand to grasp the bar, but to be honest, the sleeve is more than enough to keep the shield on her arm. With BFS hard at work on Vitruvian HACKS Series 2 (this time, a medieval-fantasy themed series), I was all but certain that Series 1 was finished. Nonetheless, this lovely lady came across my Twitter feed back in March for pre-order and I jumped on it right away. At $30, she ran about ten bucks more than the regular figures, but in fairness, you do get some more goodies in the box than with a regular release and since that included shipping, the price here doesn’t seem outrageous, especially for an exclusive release. 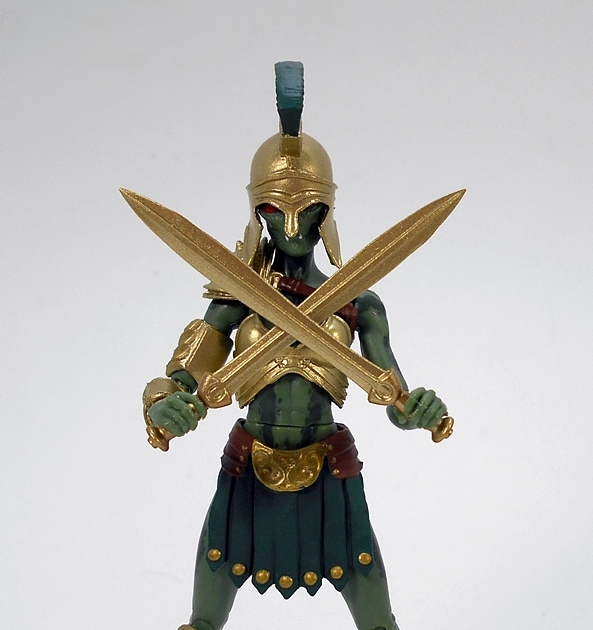 The Atelis Warrior is still available through Kokomo Toys’ Ebay Store. Thanks for showcasing this! So dynamic!